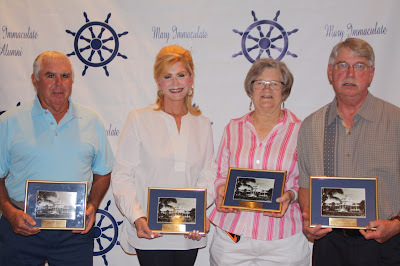 Congratulations to the members of Mary Immaculate High School Class of 1966 who were honored on Saturday April 23, 2016 at the annual alumni luncheon held at the Doubletree by Hilton Grand Key in Key West. This year's crowd was a very intimate one, smaller than in years past but everyone had a wonderful time, enjoyed mingling with fellow alumnus and catching up on each others lives. A huge thank you for the many, many donations provided by community businesses as well as individuals. Their donations made the event equally exciting as there was a large amount of items to bid on during the silent auction , which this year raised a record amount to be donated to the Basilica School to help with student tuition's. Photographed from left to right from the Class of 1966 are: Michael Ovide, Ramona Toppino Busot (representing brother, Danny), Joan Higgs and Jimmy Weekley.